Oy Vey! The Matzah Balls! A few years ago, I did a crap load of cooking. I was preparing for Passover, so I was doing what Jewish mothers do — cooking up a storm. I was Martha Stewart and Rachael Ray and Betty-freaking-Crocker — except the Jewish version. So picture frizzier hair and a bigger nose. That year, I made 3 times as many matzah balls as I usually would, to make sure that my family would have enough to eat for the entire week. It took hours, but no big whoop, right? These are the things we do for love. After the brisket went in and the noodle kugel was finished, I realized I didn’t have enough room in my freezer. So, I asked my kind neighbor if I could use a little space in the freezer that she keeps in her garage. She said of course. Passover comes and so do all the guests. I’m serving the soup, and I’m like where are all my matzah balls? I look in the freezer, in the refrigerator, in the garage. It’s cold enough. I’m thinking, maybe I stashed them in the trunk of my car. Sometimes I stick things there. I look everywhere. I only have 18 matzah balls. The thing is this: that year? We have 24 people at the house. Picturing, standing in the kitchen, confused and cutting matzah balls in half. I believe it is written in the Torah. Thou shalt not run out of matzah balls. I apologized to our guests. Months after the holiday ended, I was sitting on my driveway in the sun when my neighbor asked if I would like to have my matzah balls. “Because isn’t Passover coming up?” she asked. You guys, I didn’t even remember giving them to her. Suddenly I was like: Should I be worried? Should I call the doctor? Do I need to check about early dementia? Seriously, how did those balls get over there? Did they roll across the street on their own? I followed my friend into her warm garage. She opened her freezer and next to the ICEEs, there was my long-lost Tupperware container filled with frozen balls. All 9 bazillion of them. I obsessed about forgetting those matzah balls. And then I got sick. For 15 months, I couldn’t cook or clean or even leave my house. I couldn’t even think about making matzah balls. It’s been a few years since I hosted a Passover meal. At 32 months off Klonopin, I’m doing really well. I’m grateful to be alive, grateful to feel Spring in the air, hopeful that one day I will feel even better. I know all of this is part of G-d’s plan. And this year, I plan to enjoy someone else’s balls. 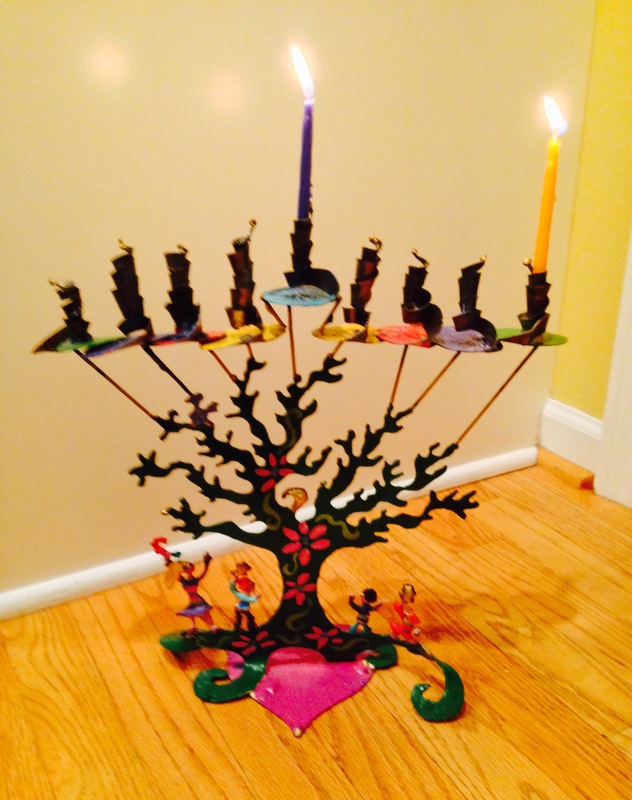 My favorite menorah, all lit up. Well, it’s the last night, and Monica Gebell of Aprons and Blazers writes about “Light.” Ahhhhh. Comments are closed here, but leave Monica a comment for a chance to win some cyberswag. Tweet this post for an extra chance to win my handmade stationery. This menorah is my least favorite: the candles don’t fit in the holes and it’s kinda boring. But it was my first menorah. I can’t retire it. Comments are closed here, but leave comments at The Messy Life for a chance to win a little sumpthin-sumpthin. You don’t have to be Jewish to win. tweet this post for an extra chance to win my handmade stationery! 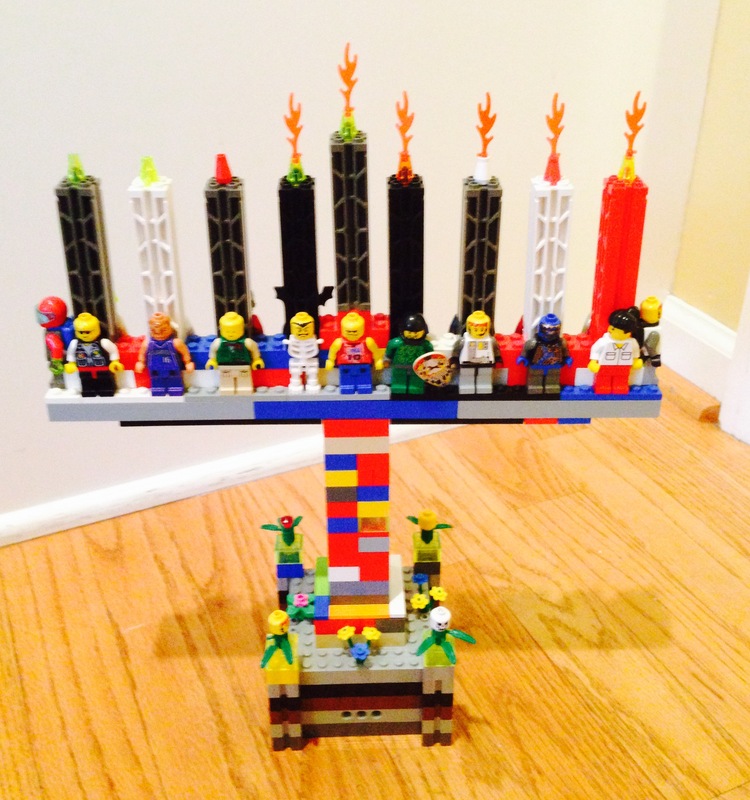 My favorite menorah. Tech Support made it when he was 5! It’s still intact! Ever wonder what it’s like to celebrate Hanukkah? 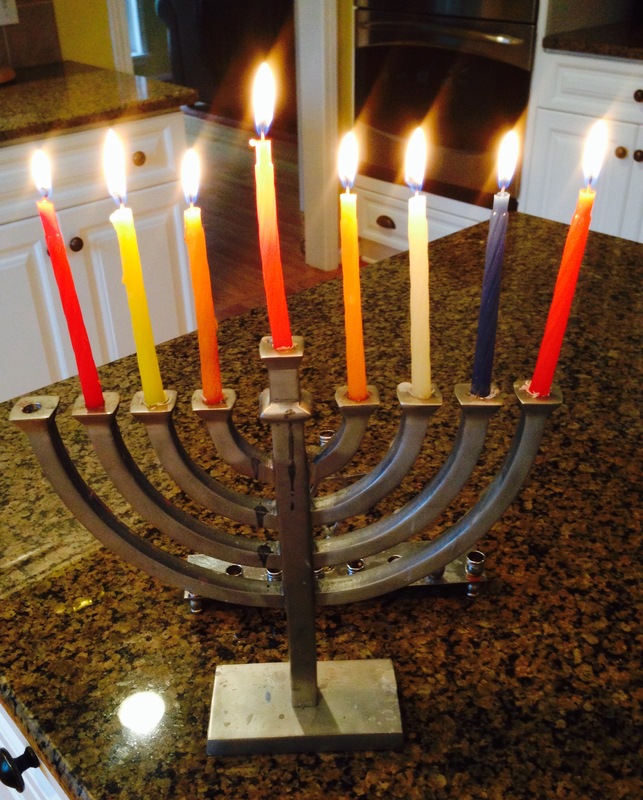 Read Tikva Kennedy’s piece “Hanukkah Without a Christmas Tree.” Good stuff! Comments are closed here, but leave her a comment for a chance to win cyberswag. Leave a comment for a chance to win some of my handcrafted stationery! I stopped into The Christmas Tree Shoppe to pick up last minute items for our Annual Hanukkah Party. Traditionally, there isn’t much décor associated with The Festival of Lights, which – truth be told – is fine by me. I see friends struggling with wreaths and trees and ornaments and inflatables and lights. How do I get ready for Hanukkah? I go down in the basement and open up one blue bin, take out my three favorite menorahs and a couple of dreidels, and I place these items on a table. That’s it. No fuss. No muss. The extent of my Hanukkah decorations. Now, you have to understand. I wasn’t looking for anything, so of course that’s when I found it: a colorful door decoration with the word CHANUKA printed boldly on the front. CHANUKA? I tilted my head, confuzzled. Because I’d never seen it spelled that way. Now don’t get me wrong, I’ve seen Hanukkah spelled a lot of different ways. Because the initial sound used to pronounce the word Hanukkah isn’t a sound used in English. The gutteral h is pronounced at the back of the throat, and — when pronounced correctly — sounds like someone trying to hork up a loogey. So I liked the decoration, but I didn’t want it if Hanukkah wasn’t spelled correctly. As it turns out, the most common spelling for Hanukkah is “Hanukkah” with 8.5 million hits in the Google search engine. “Chanukah” came in with over 3.3 million searches, and “Hannukah” came in with 862,000 hits. You might be interested to know Xanuka is considered a valid spelling. So I’m still standing there, clutching this felt decoration in one hand and my phone in the other, trying to decide if I should buy it or put it back. You know, because it was spelled weird. And then I laughed at the silly dilemma I’d created in my head. 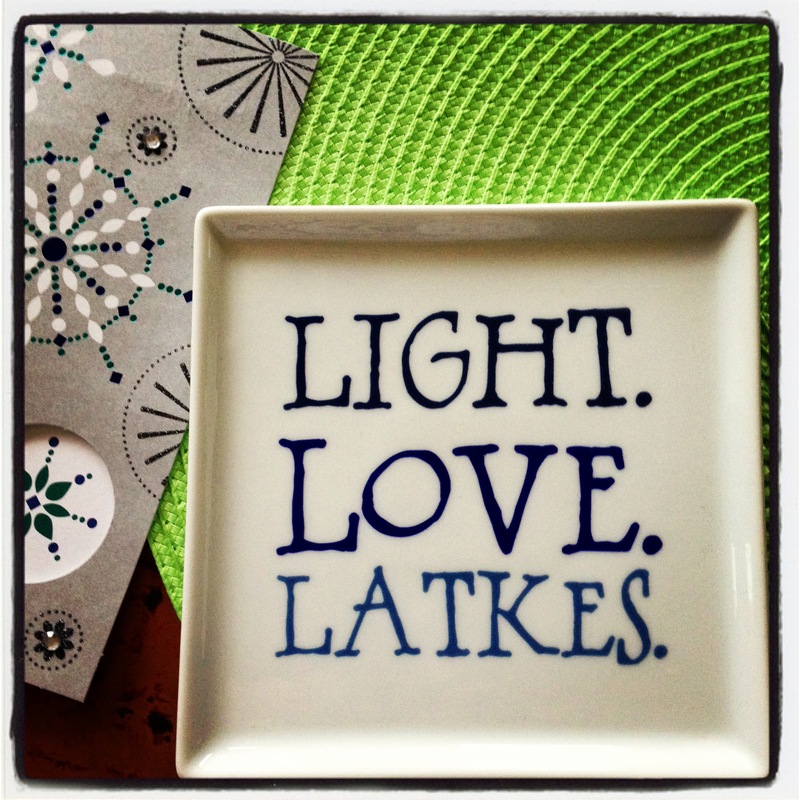 Because Hanukkah isn’t about decorations or spelling. It’s about miracles. As some of you know, I was sick for 15 months. During that time, I didn’t know anyone else who had ever been through what I was going through, and those months were terrifying, isolating and awful. Many times, I felt G-d was punishing me. Some unnameable thing kept me hanging on. Some little voice inside of me – perhaps the G-d part of myself – knew that one day the suffering would end and that I just needed to wait. And pray for a miracle. What appeals to me most about Hanukkah is the idea that miracles can be found in every day moments, how big and small things that seem impossible can come to pass. I appreciate the way we gather together to tell and retell the story of how people overcome difficult times, to celebrate the miracle of friends and family whom we love and are loved by; the miracle of having the chance to learn something new everyday; the miracle of our collective curiosity and kindness that inspires us to make meaningful connections with others. These days, I can even appreciate the eleventy-seven jillion ways we spell Hanukkah. So it’s decided. Starting now, I’m collecting decor where Hanukkah is spelled any which way. What are you celebrating this time of year? What kind of decorations, if any, do you set out? What do you love/hate about the holidays? 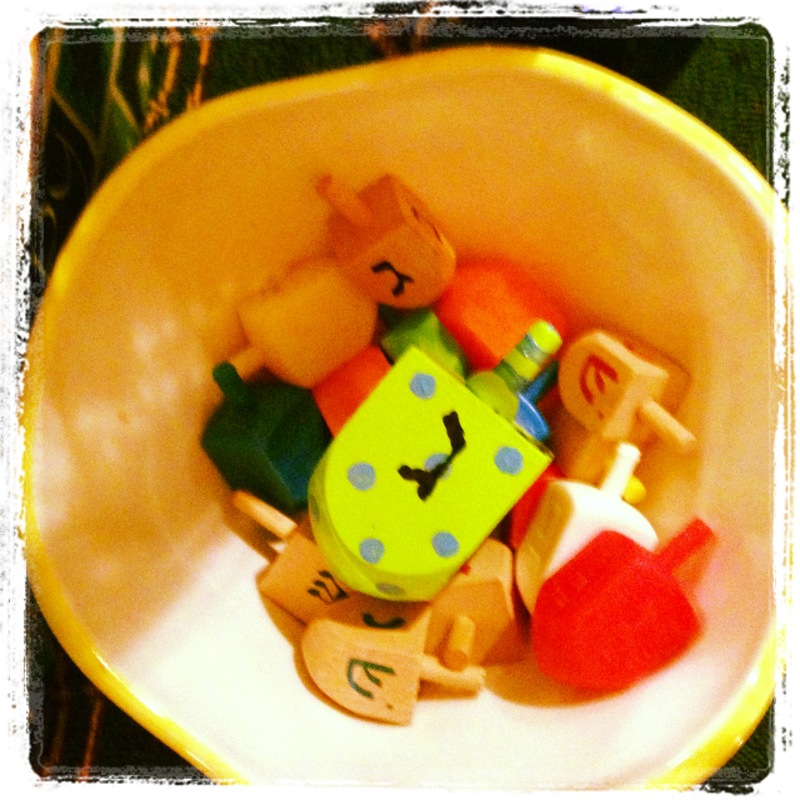 NOTE: I’m participating in #HanukkahHoopla with 7 other bloggers. In the spirit of the season, we’re giving away 8 gifts to 8 lucky commenters. 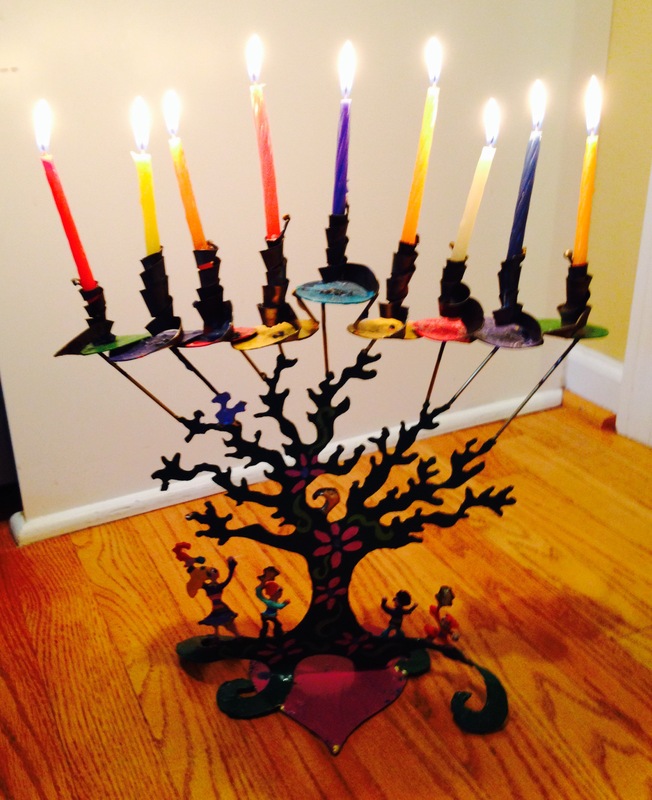 Click on the menorah to find links to other writers’ blogs & increase your chances of winning! tweet me for an extra chance to win handcrafted stationery! Comments are closed here, so leave her a good & you might win some cyberswag. Comments are closed here, but leave Rivki a good one and you can win a little Hanukkah present. Tonight is the first night of Hanukkah! 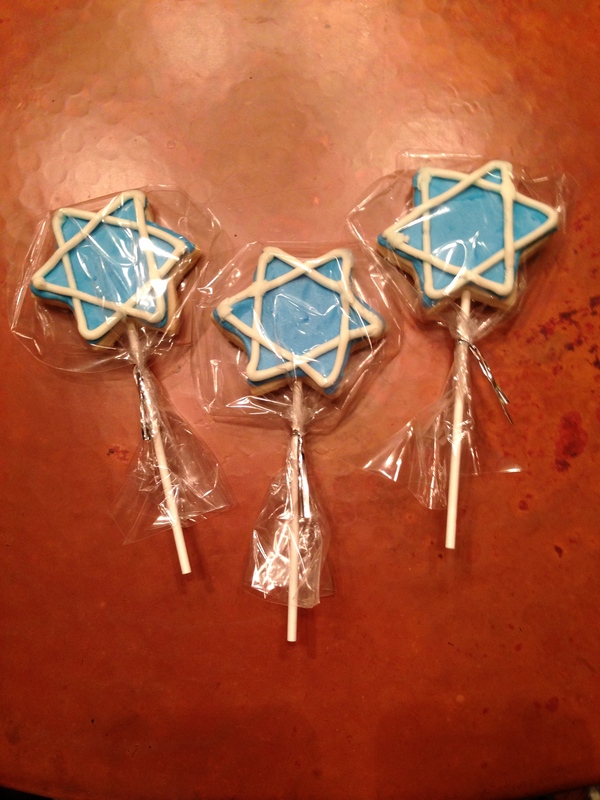 Check out these bloggers to get a sense of the Hanukkah experience. Enjoy this informative Hanukkah video! Our generous sponsors Streit’s and Mama Doni, the lead singer/songwriter of The Mama Doni Band, have provided each of the bloggers involved with this project with a little #HanukkahHoopla gift pack. See individual blogs for information on how to win. The Book Is Closed. Or Is it? When I was a little girl, a Sunday School teacher told me that on Rosh Hashanah, G-d opened a big book that had everyone’s names in it, young and old. My teacher explained how, each year, between Rosh Hashanah and Yom Kippur, G-d decided who would live and who would die in the upcoming year. And how. By fire or by water; by plague or by earthquake. The list went on forever. I remember imagining a really old, wrinkled guy in white robes sitting at a silver desk perched on top of clouds. In his smooth, shaky hand, he held a gold pen that he used to cross-out people’s names. On The High Holy Days, I dressed in the fancy clothes that my mother had laid out for me and sat in temple all day with my family. And as the adults chanted words in English and Hebrew, I played nervously with the knots on my father’s prayer shawl. And I looked around and wondered who was not going to be there the next year. Because it was a pretty scary idea: that G-d was making decisions all the time based on how we behaved. But there was a lot more to that prayer: a part that I didn’t figure out until years later. But Repentance, Prayer, and Charity avert the severe Decree! This is Your glory: You are slow to anger, ready to forgive. G-d, it is not the death of sinners You seek, but that they should turn from their ways and live. Until the last day You wait for them, welcoming them as soon as they turn to You (314). Those words are a gift. They mean that if we really have open hearts and want to do right for all the messed up shizz we have done throughout the year, through prayer and acts of love and kindness, we can change a course previously set in motion. Jews have ten days between Rosh Hashanah and Yom Kippur to try to set things right. You were bad so I’m putting you out of your house, buddy. Nothing you can do about it now, sucker! G-d wants us to recognize and admit that we have goofed up during the year. And we can fix these things. To have that chance, to be able to fix what has been broken, is something I take pretty seriously. There is a scene from the movie The Jazz Singer (with Neil Diamond) that I can’t watch without crying. It is a scene that shows a little of what Yom Kippur is about. For those of you who might be unfamiliar with the film, Yussel Rabinovitch, the son of an Orthodox cantor, decides to leave his religious tradition and follow his heart. He changes his name, loses his Jewish identity, and becomes Jess Robin. At some point, Jess is in New York and he runs into one of his father’s old friends who tells him that his father has been ill. The doctors won’t let Cantor Rabinovitch sing on Yom Kippur due to his high blood pressure. But Jess Robin humbly returns to his roots and becomes Yussel Rabinovitch for Yom Kippur. Even though his father has declared him dead. Even though he has been excommunicated. 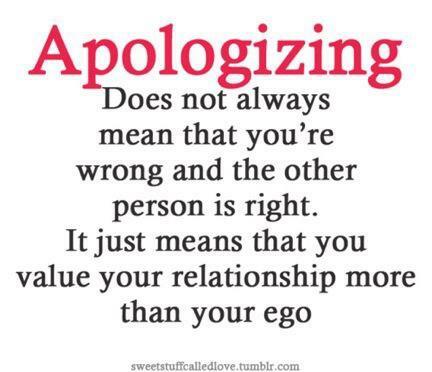 He goes back to apologize the only way he can. This is what we are supposed to do. We are supposed to humble ourselves — to those we have hurt, to G-d — in that kind of honest way. The High Holy Days give Jews a chance to reflect on the wrongs we’ve committed to those around us, to make amends for those wrongs, and face the new year with gratitude, and hope that we’ve been given a chance to start anew. Bottom line: We have all sinned. This year, the fasting is over. The table has been cleared. I’ve done what I can. I guess this is where the faith part comes in. Now the trick is to be a better me in 5772. Now listen to Babs sing and tell me what you feel when you hear her voice. Stern, Chaim. Ed. Gates of Repentance: The New Union Prayerbook for the Days of Awe. 2. New York: Central Conference of American Rabbis, 1985. 313-4. Print.